Putin Critic Says He's Afraid The Kremlin Would 'Wipe Me Out One Way Or Another' : The Two-Way Bill Browder, who has been trying to expose corruption in Russia, says he does not feel safe knowing the Kremlin has issued an international arrest warrant for him via Interpol. 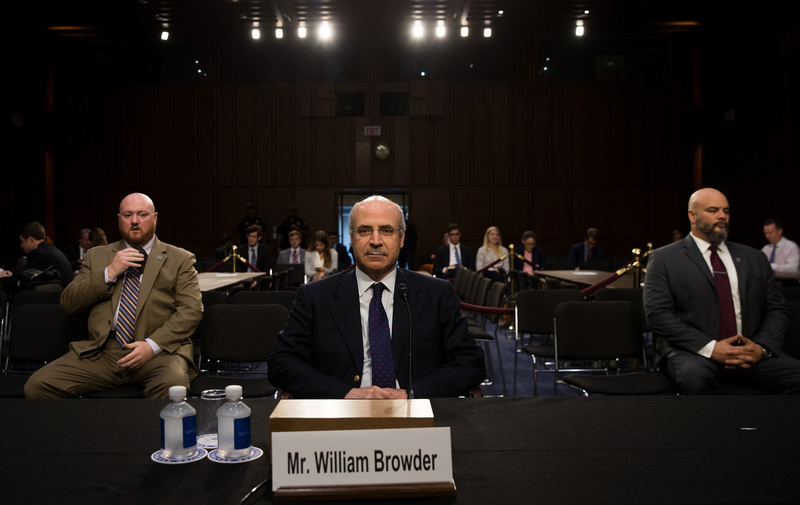 Bill Browder, chief executive officer of Hermitage Capital Management, takes his seat as he arrives for a Senate Judiciary Committee hearing in July. Bill Browder, a top critic of Vladimir Putin who has been trying to expose corruption in Russia, says he does not feel safe knowing the Kremlin has issued an international arrest warrant for him via Interpol. "It's all very scary," Browder tells NPR's Rachel Martin. "It's not just arrest. They could try to assassinate me on the street. They've made these threats, and so I am genuinely Putin's No. 1 foreign enemy, and they'd like to wipe me out one way or another." Sunday's warrant stems from the Kremlin's recent claim that Browder murdered his lawyer, Sergei Magnitsky, who died in a Moscow prison in 2009 after the two men uncovered a multi-million dollar corruption scheme. His death led the American-born Browder, who's now a British citizen, on a worldwide quest to punish the Russian officials accused of torturing and killing him. Browder pushed the U.S. and other countries to pass what is now called the Magnitsky Act, which freezes American assets and bans visas for certain Russians. "This infuriates Putin. He's just so mad," he says. In retaliation to the U.S. sanctions, Russia limited U.S. adoptions of Russian children. Russia has also lobbied for repeal of the act, and it is that reason a Russian lawyer says she met with Donald Trump Jr. in 2016 at Trump Tower. This murder charge, Browder says, is a "Kafka-esque" twist in the story. He says he was expelled from Russia more than a decade ago. "It's just beyond belief — and it's so unbelievable and so outrageous that it shows that they're really getting rattled, that Putin is very, very upset by the consequences of the Magnitsky Act and how it affects his personal interests," he tells NPR. On Monday, NPR reported that Browder was denied entry into the U.S. after the State Department revoked his visa, an issue that has since been resolved and he has been cleared to travel to the United States.